low-level python hacker and author of RPyC, Construct and Plumbum. writes about python, algorithms, software architecture and whatever else comes to mind. Following my Deducible UI post, and following some of the criticism it had received, I'd like to share something I've been working on (read: experimenting with) at my work place. 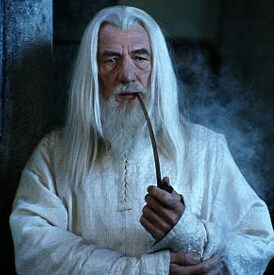 You see, we have some "interactive wizards" that storage admins use to connect storage arrays to their hosts (say, a DB server). These wizards prompt you with questions like your what's your username, the name of the pool/volume, whether it's an iSCSI or a Fiber Channel connection, etc., and then they go and perform what you've asked for. These wizards operate in a terminal environment, but we've had thoughts to make GUI/web versions of them. This would be a considerable effort with the current design. Another issue they currently have is the mixing of "business logic" and presentation together. For instance, the code that scans the devices attached to your host also prints ANSI-colored messages or reports its progress. All in all it works fine, but there's lots of room for improvement. I began to investigate this corner a month or two ago. The initial observation was that such wizards have a pretty rigid and repetitive structure, thus we can find some abstraction or a "toolkit" for "expressing" wizards more compactly. This has also led to the realization that once the business logic and presentation are separate, there's no reason to limit ourselves to terminal-based interaction: our wizard-toolkit could do the plumbing and work with terminals, ncurses, GUIs, web-browsers, etc. The business logic would remain oblivious, and we could have a nice GUI at zero-cost! There was also a second issue of styling, i.e., printing text in color, that I wanted to get r id of. This part was easy: I thought, why not employ the model of HTML and CSS? Let's separate the structure (semantics) of the text from its styling. Instead of printing a banner for titles, we'll display a Title object, whose exact appearance is determined by a "style sheet" (a class, of course, not actually a text document). For instance, when we're using a color-enabled terminal, the title would be printed in bold and followed by an empty line; but if our terminal is color-blind, we'll render the text centered and surrounded by = marks. Another example is error-handling: instead of printing error message in red every time, we'll display an Error object; on a terminal, this would be rendered as red text, but when running in a GUI, rendering this object would pop up a message box. I'm going to ignore this for the rest of this post, as this is really a side issue. Now let's get to expressing wizards, or more generally, dialogs. Following some earlier iterations, I came to the model where a dialog is a "container object" that's made of dialog elements. These elements can be output-only (such as a welcome message), or input-output (such as a message telling you to choose one of the available options). 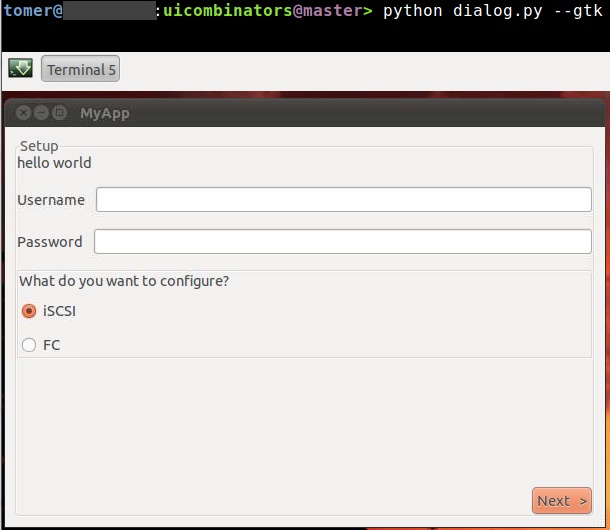 A dialog is "executed" by a DialogRunner that renders it and returns the results gotten from the user. 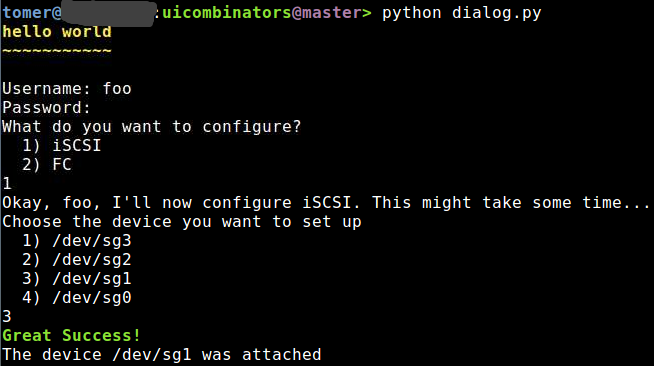 It's quite important to note that dialog elements within a single dialog cannot be interdependent -- that is, if you want to ask the user for his name and then show "Hi there %s" with the user's name, this has to be done as two, serial dialogs. It's a short and incomplete snippet of course, as I'm only going to cover the big picture. The main function creates a dialog object d and passes it to ui.run, which "runs" the dialog and returns the results, as a dictionary. Notice that the dialog elements Input, Password and Choice all take a first parameter -- this is the key under which the result would be placed in the returned dictionary, e.g., res["un"] would hold the user-provided user name, and res["pw"] would hold the password. Text, on the other hand, is an output-only element, so it doesn't return anything and doesn't take a key. Long story short, we're asking the user to enter some information and choose one of two options, and then continue processing based on the selected option. At the bottom, we determine how to run the application based on a command-line switch: if --gtk is given, we'll run the dialogs through the GtkDialogRunner; otherwise, we'll use the TerminalDialogRunner. So of course it's far from perfect, but then again, it's a small research project I've only put ~15 hours into. It suffers from some of the problems I've listed in the deducible UI post, for instance, the GUI hangs when the business logic performs blocking tasks. This could be solved by moving to a reactor-based model, but I've tried to keep the existing wizard code in tact as much as possible. A hanging GUI is not nice, but it's not the end of the world either, and there are numerous ways to overcome this. Another benefit this design brings along is the ability to automate testing by using mock dialog runners. Since our business logic is only exposed to the returned dictionary, we can use a dialog runner that actually displays nothing and returns a scripted scenario each time. We can even go further: because our business logic "talks" in high-level primitives like Choice, we can compute the Cartesian product of all choices and run through each of them. We can show that we've covered all paths! And we can do this automatically... without people hitting buttons and keeping logs of their progress. Anyway, I just wanted to show that it's feasible. I'm not releasing any code as this project is currently in very early stages, and it's something I do at work. Perhaps we'll open-source it in the future, if it proves useful enough.